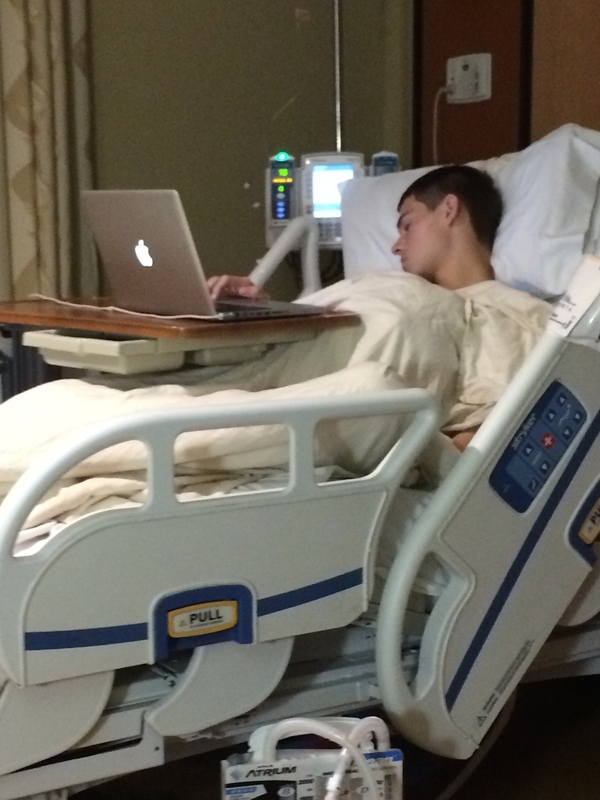 My fifteen year old son Joel had surgery yesterday. He had a repair done on his chest to correct a condition known as pectus excavatum. This isn’t an uncommon condition, but generally it is more often repaired for cosmetic reasons. Joel’s was corrected because it was actually affecting his heart function. The surgery, similar to open-heart surgery, was not an easy one. His sternum was cut away from his ribs, and then repositioned with wires to make room for his heart to beat correctly and continue to grow until he reaches his full adult size. As expected, he will be in the hospital for several days while we wait for his chest tube to be removed. Room 630 of the local medical center will be my home for the better portion of this week, as I camp out with him during these long days of recovery. After just 24 hours, I’m already reminded of some lessons I learned when my husband Jon spent most of the first four months of our marriage lying around in hospitals. 1. Hospitals are not restful or relaxing. The door to Joel’s room was practically revolving, as nurses walked in and out every hour on the hour, checking blood pressure and temperature, looking at the incision, doling out pain medications, and taking chest x-rays. Of course, my bedding options weren’t the great, just a tiny little cot with a hard mattress. “Great!” I thought. “Now I can get some good rest before the 7 am shift change.” And I did … sleeping hard until 6 am, when the door cracked open and in walked our friendly nurse. So much for getting good rest while in the hospital. After I spent most of the morning yawning, I crawled into Joel’s empty hospital bed for a two hour nap. Not a single nurse bothered us during that period of time. No doubt we will discover that our room once again is equipped with a revolving door between the hours of 10 pm and 6 am. I think Joel and I will both be glad to see our own beds at the end of the week. 2. Hospital time is not at all like regular time. Mostly, the days of my life seem to speed along in a blur, racing by so quickly I never feel like I have enough time to do everything I need or want to do. Not so at the hospital. The hands on the clock seem to move slower here. Minutes and hours are no longer useful measures of the passage of time. Instead, time is measured from one dose of medication to the next, the space between visits or phone calls from family or friends, the delivery of meals, or the last time the nurse popped in to check on vitals. The clock on the wall does me no good. It’s been barely 24 hours since I settled into this room with my son, and somehow I it feels as if we have been cooped up in this room for a week. Yesterday, when I arrived at the hospital, I was a cognizant adult, aware of the time and place. Yet, barely a day later, I am already dependent upon the white board hanging on the wall to remind me of the day of the week and the date on the calendar. Without it, I would be lost in time. In my bags, I brought along several new books, crossword puzzles, my laptop, note on a writing idea that’s been brewing in my mind for nearly a year now. I’ve got many forms of entertainment and I’ve got time. What I don’t have is motivation. My brain feels numb and unable to process correctly, as if not only has time slowed down but now I also think in slow motion. Yet, I’m treasuring these moments with my boy. He’s growing up so quickly, nearly a man. At six feet tall, he is already man-sized. And now I get a week of him all to myself … to connect and bond with my son as we prepare to enter into these last remaining years of his childhood. Despite the odd feelings, I’m trying to embrace these hospital days, for this time will pass me by as well. On truth about time, whether it’s regular time or hospital time, is that once it has passed, you can never get it back again. 3. If you want to feel blessed, go visit a hospital. This morning, a perky nurse helped Joel take his first walk post-surgery. She taught him how to stand, using his legs to lift his body instead of pushing with his arms. Joel popped right up, not struggling at all. We don’t have to look far to find someone else whose situation is bleaker than ours. Joel is definitely the youngest, healthiest patient on the cardiac floor of the large medical center where he is hospitalized. All around us are the family of cancer patients, trauma victims, and those who are suffering from far greater situations than we have ever been through before. While I certainly feel grateful for the blessing of health, it’s a hard reminder of what so many people endure daily and how smiles and kind words and sincere offers of prayers can be encouraging during trying times. Thanks so much to all who have prayed. Joel is doing remarkably well and the pain is very well-managed. We are hoping to be back at home on Thursday, perhaps Friday if things take a little longer. Take good care of Joel and yourself during this time. Too bad about the sleep but at least he is being well taken care of. All the best for a speedy recovery. Enjoy your time together even if there is a revolving door. Time is precious as you see in the hospital. Thanks, Cheryl! Thankfully, we came home a full day earlier than expected … sleeping in my own bed was amazing. I thing I learned was to sleep throughout the nurses visits at night. Sounds impossible, but it gets easier. They don’t really expect you to be cognizant. You need your rest for when he’s awake during the day. Praying tonight is better. Glad to hear he’s doing so well. I am all too familiar with the lagging brain syndrome. My mother-in-law has been in the hospital for 23 days. Now I’m taking care of my house and keeping food on hand for the revolving visiting schedules. My motivation to do more than play on the computer, do puzzles, or watch TV has dropped to almost zero. I’m trying to get myself back on track. It seems to be two steps forward and five back. I’m in limbo. My prayers are with you and Joel. Twenty-three days is a long time! Prayers for your family as you deal with all that comes from extended hospital stays. Pleased and thankful to hear Joel is doing so well. So it isn’t just being on the pain medication that’s so discombobulating. You’re experiencing it, too? Definitely an experience for this hospital-weary momma! I absolutely agree with that last point! Glad Joel is doing well, and we’ll keep praying for you all as he recuperates! Thank you! We are glad to be home already … Joel is doing remarkably well, and we are extremely pleased with his rapid recovery. He’s up, walking around, fixing himself large snacks, doing schoolwork, and generally acting as if he didn’t have his chest cracked open on Monday. I don’t know how I am going to tie him down for the next two months, when he is under strict dr’s orders not to lift more than 5 lbs for fear of undoing all of the restructuring the surgeon did in his chest!